If you want to enjoy succulent smoked BBQ at home, then a smoker is a cooking accessory that you’re going to need. Smokers are growing in popularity, thanks to new designs that make it easier to get perfect results from a whole range of different foods. Whether you want to cook smoked ribs, a whole turkey, or even a smoked cut of BBQ pork, a smoker will become one of your favorite ways to cook. With so many models entering the market, it can be hard to decide which is right for you. The best smokers are not only good at cooking, but they’re also made to last and have features that make them more convenient and easier to use. If you’ve been stuck on your decision for some time, then this list of the five best smokers will be all that you need to find your next outdoor cooking investment. With their outdoor grills, Dyna-Glo has become a popular name in home cooking. In addition to their traditional grills the company also offers efficient gas smokers, with the Dyna-Glo DGY784BDP 36 Inch LP Gas Smoker being an affordable option when you need large capacity and a solid design. This model is a surprise in its price range, because it offers one of the highest capacities out of all of the smokers on this list. 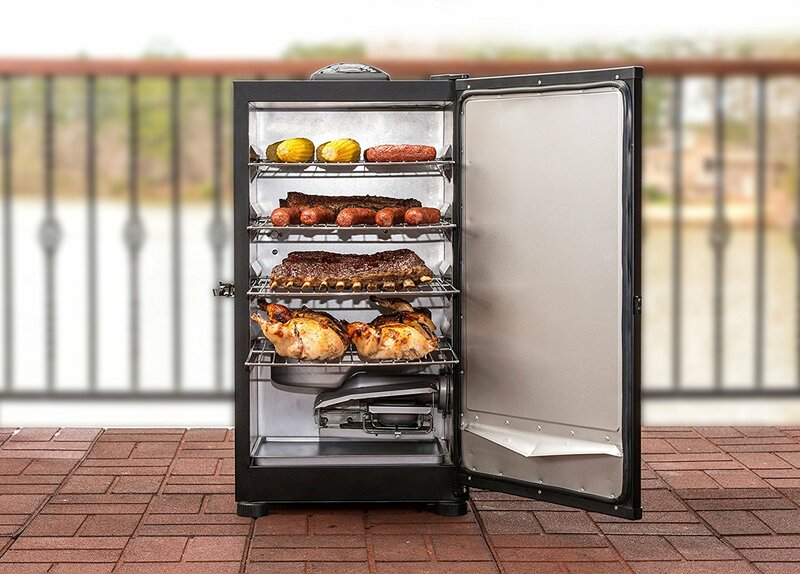 There’s 784 square inches of total cooking space with four individually adjustable steel racks.Large birds and cuts of meat can be smoked easily inside the Dyna-Glo, and you will never feel like you are limited in size. This is one of the best smokers because it offers a double door design, allowing you to control temperature and cooking speed with ease. 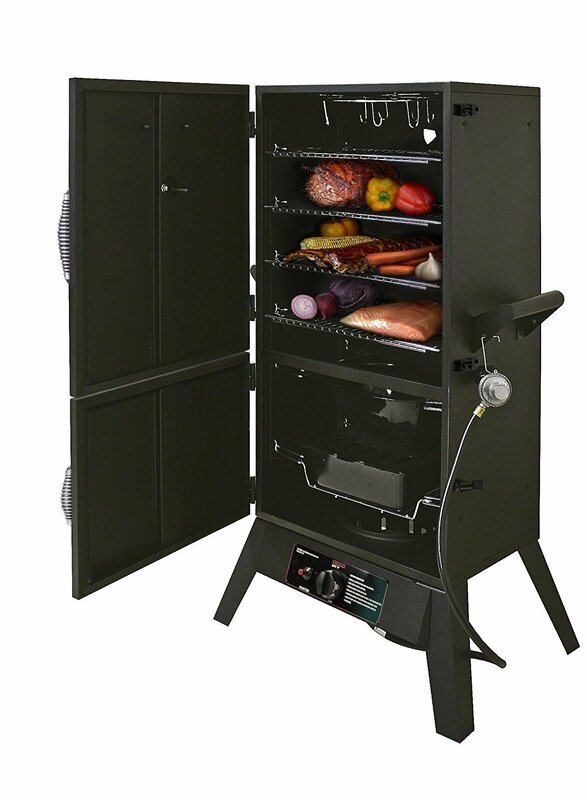 More convenient than a charcoal smoker, this model runs from LP Gas and will require minimal cleanup and maintenance after a long cooking session.If you do prefer the flavor offered by a charcoal smoker, then Dyna-Glo also offers a Vertical Charcoal Smoker with an almost identical design. Materials used on this model are top quality, with heavy grade steel ensuring that this will last for many smoking/grilling seasons to come. The assembly is simple out of the box, and you won’t need to worry about parts not aligning correctly when you follow all of the instructions closely. .Despite it being highly affordable, it doesn’t compromise on looks, functionality, or the longevity of the materials and construction methods that are used. Online consumer reviews rate this product and average 4.1/5 stars, giving you the confidence that it’s a great buy that will meet all of your smoking needs. This model features four steel shelves and an insulated design that allows for fast and efficient smoking. If you want quality smoking results at home but prefer to use electric appliances, then the Masterbuilt 20071117 30 Inch Digital Electric Smoker deserves a closer look. 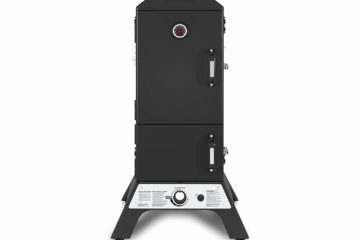 Priced similarly to the Dyna-Glo gas smoker, this model features four steel shelves and an insulated design that allows for fast and efficient smoking. One of the unique features is Masterbuilt’s patented wood chip loading system. You won’t need to open the door to add new smoker chips, which eliminates heat loss and increases efficiency. This will ensure that you can smoke as much as you want, without a skyrocketing electric bill.Electronic smokers are the most convenient smokers of all, because you can closely monitor and control temperatures on a digital control panel. This means consistent results every time that you’re cooking, no matter what you want to put into the smoker.With 730 square inches of cooking space you won’t ever feel like you don’t have enough room. If you are cooking larger birds like turkey, chicken, and duck, then you can simply remove a shelf to add more headroom. The same can be done for larger cuts of meat.With an electronic smoker like the Masterbuilt 30 Inch Digital Electric smoker you will understand what it means to “set and forget” when you are cooking. This is one of the most convenient ways to enjoy the smoked foods that you love, without having to head to your nearest BBQ restaurant. Not everybody needs a large smoker for regular cooking. If you consider the best smokers to be those that are relatively compact, then the Camp Chef Smoker 18 Inch Smoke Vault could be the model for you. 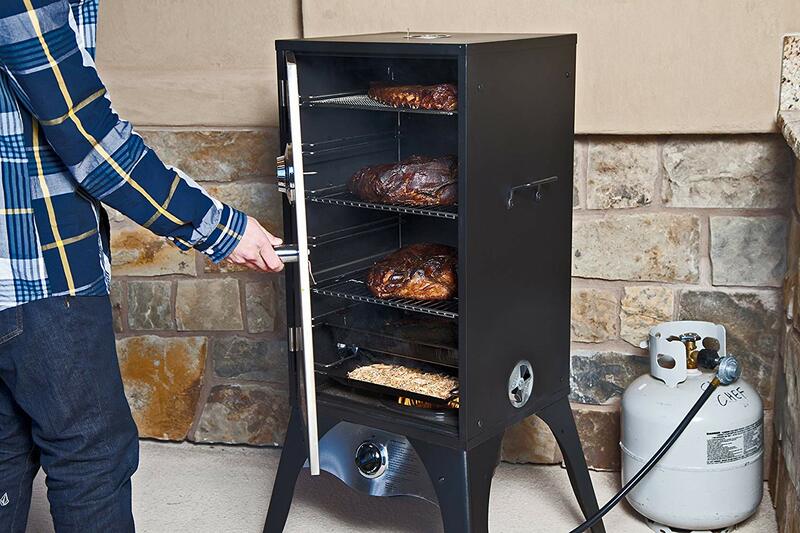 This is a gas powered smoker that features two adjustable smoking racks which each provide 210 square inches of surface area. Total BTU rating for the unit is 18,000 per hour. Although this rating might seem low if you’re used to comparing grills, it’s actually more than enough for a smoker. The key with great smoked food is to cook low and slow, so you won’t be limited when using the smoke vault.The size and design make this one of the best smokers on the market. Steel construction ensures that it is sturdy and long lasting, and you could consider this as a long term investment that won’t have to be replaced any time in the near future. When fully assembled, everything feels sturdy and there’s some real quality craftsmanship in the individual components.The unit is easy to clean thanks to a porcelain tray that can be completely removed, and there’s also a jerky smoking rack for secondary cooking. If you think that you need something big and powerful for smoking, then the Smoke Vault will help to change your mind. If you’re cooking for a family or just want something to smoke with for a few special occasions throughout the year, then the Smoke Vault would be a great choice. Smoke Hollow is a company this is well known for high quality smokers. Smoke Hollow is a company this is well known for high quality smokers. The models they produce are some of the best smokers on the market, and if you need a lot of space inside a smoker then the Smoke Hollow 38292G 38 Inch 2 Door Propane Gas Smoker would be perfect for your needs. The large size means that you get a total cooking surface area of 1120 square inches. There are also some nice additions in this model, such as the sausage hanging rack. 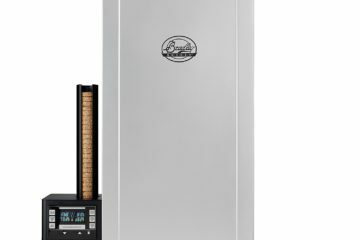 If you’ve ever wanted to make your own specialty smoked sausages at home, along with BBQ and other large smoked pieces of meat, then this is probably the first model that you should look at.This model holds temperature well, which is essential when you are looking for a fuel efficient smoker. The insulated design and quality door minimize smoke loss, and this can help to reduce your cooking times. An electric ignition and burner control will allow you to keep temperatures exactly as you need them, and the front mounted thermostat is convenient and easy to read. The quality and cooking ability of this smoker is second to none.In terms of aesthetic design, there’s nothing overly special about this model, which could be disappointing for some buyers. It’s essentially a box design with no embellishments, and it looks rather monolithic once it is out of the box and fully assembled.This may or may not be a problem for you. Some people want their smoker to be purely functional and don’t mind about the looks. There are others who want something presentable that can be proudly displayed in an outdoor cooking station. If you want something with great aesthetics then you will likely be more interested in the previously mentioned Dyna-Glo or Camp Chef models. If you care about size without limitations, and looks are secondary, then the Smoke Hollow is a great choice. The quality and cooking ability of this smoker is second to none, and this is reflected in the high praise that it has received from owners. The average online review rating is 4.3/5, making this one of the most-loved smokers on this list. Alternatively, if you love everything about this smoker but want something with a more unique look, then you could choose the Smoke Hollow 38205GW 38 Inch Propane Gas Smoker with Window. The capacity is exactly the same and it’s a high quality smoker that can give you a direct view of your food as its cooking. Overall, you’ll find all of the Smoke Hollow smokers to be of excellent quality, and there’s no doubt that the company makes some of the best smokers that you can buy today. You won’t be disappointed by this model, and there are both smaller and larger models from the company if you like the utilitarian look and unbeatable cooking abilities. To finish off our list we have something that is unique, highly capable, and more in-line with other modern electric cooking appliances.Smoking is a traditional form of cooking, but that doesn’t mean that designers have to stick to the age old traditions in every area. 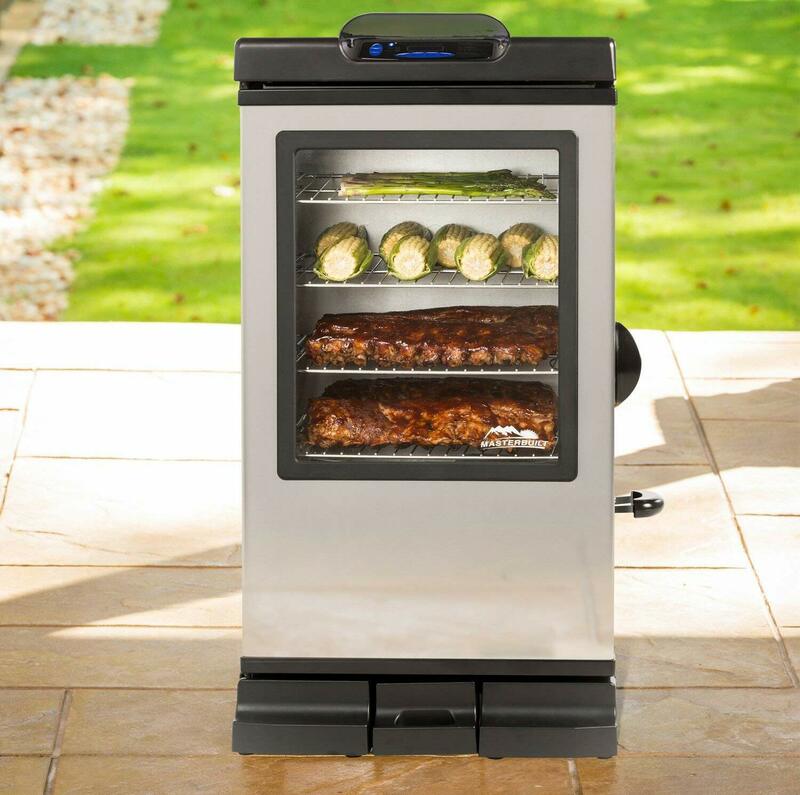 The Masterbuilt 20072115 Bluetooth Smart Digital Electric Smoker is a 30 inch smoker designed for the modern age.It’s one of the best smokers because it is convenient to cook with, offers a good amount of space for the average person’s needs, and it is one of the easiest smokers to use on this list. You will immediately notice that this smoker breaks away from traditional design. It looks more similar to modern kitchen appliances than it does to gas and charcoal smokers. It is powered by electricity, and has a large front facing viewing window so that you can observe your food as it cooks. 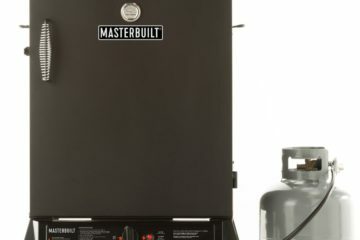 Similar to the previous Masterbuilt smoker that we have looked at in this list, this model allows for exact temperature control through a digital control panel. The big difference here is that this particular model has Bluetooth functionality.The Bluetooth integration is more than just a gimmick. You can connect the Bluetooth to your smart device and have direct control over the cooking temperature, the electronic timer, the light inside of the cooking chamber, and you will even be able to check the internal temperature of your meat. This eliminates the need to purchase an additional Bluetooth meat probe.Masterbuilt includes their popular wood chip loading mechanism which means that you don’t have to open the smoker to add more wood chips. There’s also a front access grease pan which makes cleanup simple. Electric smokers are highly efficient and this one is no exception. If you are regularly smoking meat, fish, and vegetables, then this is a great option that will eliminate the need for solid fuel storage or gas canister replacements. 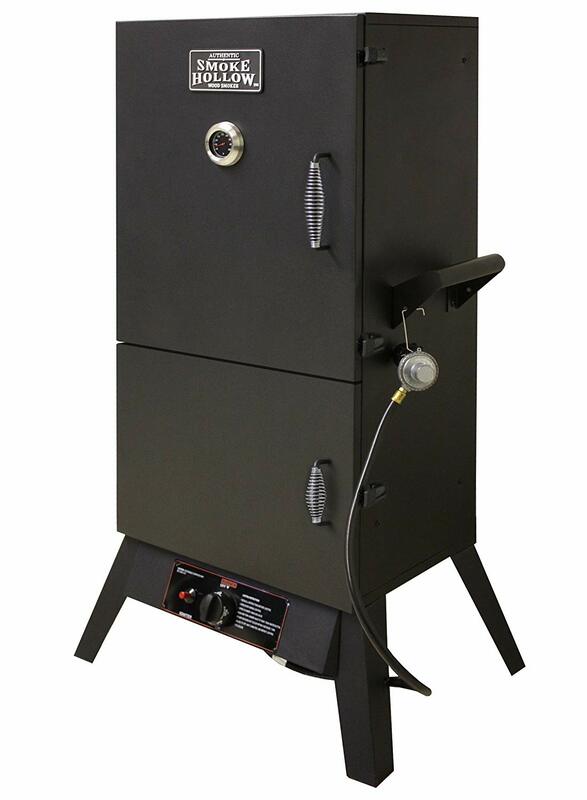 With capacity that can allow for 48 sausages, two turkeys, 12 chickens, or four pork loins, this is a smoker that can take care of all of your home smoking needs with ease. All of our best smokers offer excellent cooking ability and great value. With all of these models coming in at under $300, it’s now more affordable to get the cooking results that will impress your friends and family. There’s different choices ranging from gas powered to electric, and with models like the Masterbuilt Bluetooth smoker you can even cook with the aid of your smartphone or tablet. 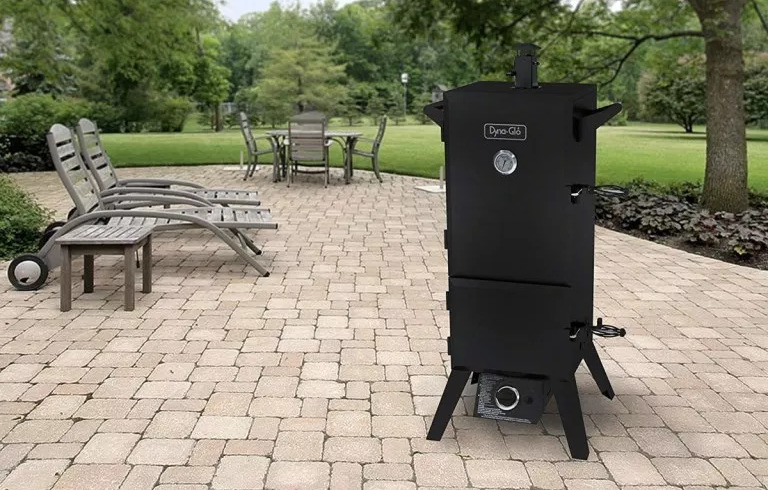 If you’re looking for a traditional charcoal smoker or even a combination smoker/grill, then make sure you check out all of our reviews and product comparisons today.